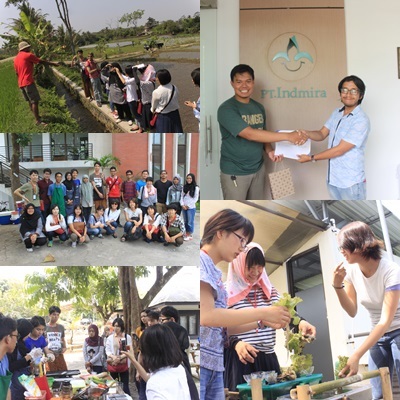 On 13 August, Indmira was visited by participants of DREaM. This international student summer program is held annually by the International Affairs Office of Gadjah Mada University (UGM). This year marks the seventh year of this event, which are attended by students from Japan, Korea, Malaysia, Thailand, UK, and Indonesia. This year’s theme is Food Security, which is to bring awareness to the world food crisis. One of the activities during DREaM UGM 2015 is internships with several NGOs and companies that are involved in agriculture. The participants and partner institutions are divided into three groups to cover the topics of Food Production, Food Economy and Food Fairness. Indmira is chosen to be one of the partners in the Food Fairness topic. There was a discussion session between the students and partner institutions in UGM campus on 11 August, during which Food Fairness was explained as the relationship between producers and consumers. Ideally, producers get the appropriate reward for their efforts in producing the food, whereas the consumers get the appropriate food for what they are willing to pay. Hermitianta Prasetya, from Jejaringan Pangan Lokal (Local Food Network) Yogyakarta, brought up an excellent point. To achieve Food Fairness, consumers should know where their food comes from. And the shorter the food supply chain, the more just the affair for the producers and consumers. The visit on Thursday started at the Fun Farm on Merapi (FFM), one of Indmira’s CSR partners. Here the participants were accompanied by Koko Sasongko and Bob Singadikrama and learned about verticulture. Employing used 25 kg grain bags, this planting technique allows 10-12 plants to be grown in a small area. Not only does it save water, it is also suitable for urban gardening where space is limited. Students then took a tour of the surrounding areas where they could see food production first hand. After FFM, the DreAM grouped headed back to Indmira headquarters to have lunch. The meals were prepared by Letusee and consisted of tempe salad with dabu-dabu dressing. The refreshments were cold kombucha and infused water. Steffi, Nuha, and Fikri from Letusee happily cooked and answered questions from the students. In the meantime, there were some students who visited the rooftop garden and helped harvest red leaf lettuce from the verticulture drums. Lunch was followed by a sessiong of sharing and discussion with Andi Nusa Patria, Indmira Vice President. Andi further explained about Food Fairness and the threat from the world food crisis. He asked us to thoroughly reconsider our view of food; wherein the threat might have come from the people not understanding the difference between the necessity and want. Our awareness of the food source and how we process our food start from knowing how food is grown or, at least, where it comes from.